Reach more people with a better church website. Our church WordPress themes make it easy and low cost. Introducing Saved, a new WordPress theme with real-time homepage builder — specially designed for your church website. Get everything you need with one of our Packages which include all of our church WordPress themes, our Church Content plugin, guides with videos, helpful support and starter website content. Our WordPress-powered church website solution is ideal in terms of cost, ease of use and flexibility. Support is included. You get access to all of our church WordPress themes. Try what you like and switch to a new release anytime. Our Church Content plugin adds powerful features to WordPress that every church website needs. WordPress is free and powers more than 70,000,000 sites. Create and manage your church site easily. Unlimited pages. Easily publish sermons and even podcast them. Post events to a calendar. Show locations, staff bios and more. We provide step-by-step guides with videos and friendly support. We'll help you build your new church website. Save time with starter website content included with your theme. Just change and add your own content as needed. Use the Customizer to change your logo, colors, background and fonts. Web design skills are not necessary. 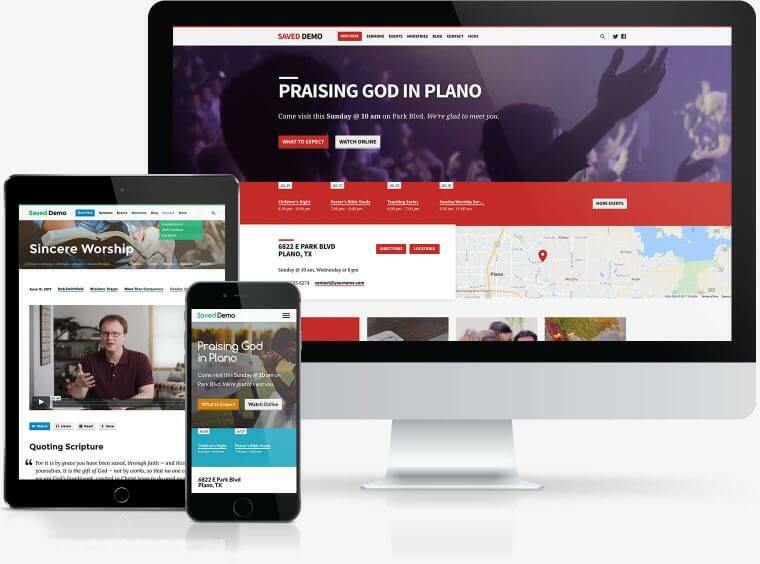 Our church WordPress themes use responsive design for a great experience on phone and tablet screens. A single click installs theme updates containing improvements. WordPress updates itself automatically. Save time with recurring events. Reach more people with SEO. Ministries, video, social media and more. Gutenberg-ready. Ask a Question We're happy to help!